Resource pooling concept on HYPE-V becomes essential day by day to virtualization data center administrators. I’ve discuss about storage pooling sometime back. You can refer that here. Now we’re in the Server 2012 R2 HYPER-V stage and the concept stays the same. Now let’s take a scenario before I enter to the technical write-up part. 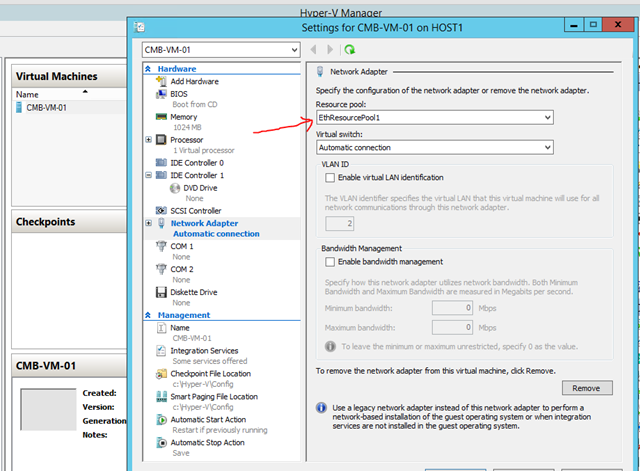 Let’s assume you’ve two different HYPER-V host servers (HOST1 & HOST2), each having virtual switch which connects the VM’s to the external network. Host HOST1 having external VM switch name as “External-SW-A” & HOST2 having switch name as “External-SW-B”. Assuming you export or live migrate a VM from HostA to HostB you’ll have a technical issue saying VM cannot find the network switch. Simple reason behind is due to the different switches names on each host. This can be more complex when we’re talking about more HYPER-V hosts having different switches names. If you’re more interested in this feature you can find more parameters and technical information here. Hi Mayer, thank you for highlighting that. Appreciate that.